Source: “Planting Rice and Harvesting Slaves. Transformations along the Guinea-Bissau Coast, 1400-1900”, Walter Hawthorne (2003). What most people might not know however is that because of enduring Luso-African (often involving Cape Verdeans or their descendants) as well as Fula and Mandinga trading networks the connections between the main slave ports of Guiné Bissau with other parts of Upper Guinea never really were discontinued (for more detailed discussion see this page). So that often times the captives passing through Guinean slaveports like Cacheu or Bissau on the coast or Geba and Farim upstream the rivers would have originated from outside of Guiné Bissau’s presentday borders. 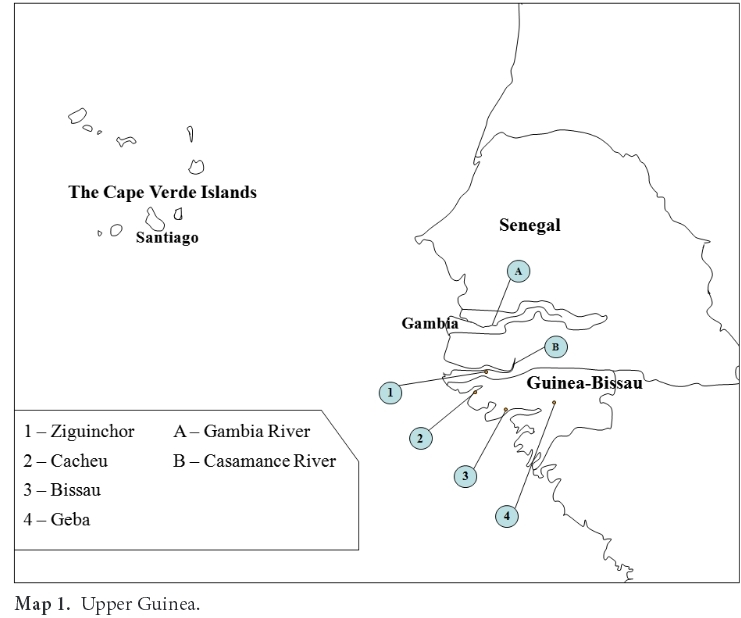 Main slave ports in Guinea Bissau. Farim is not shown but it would be located upstream the river Cacheu near the border with Senegal/Casamance. 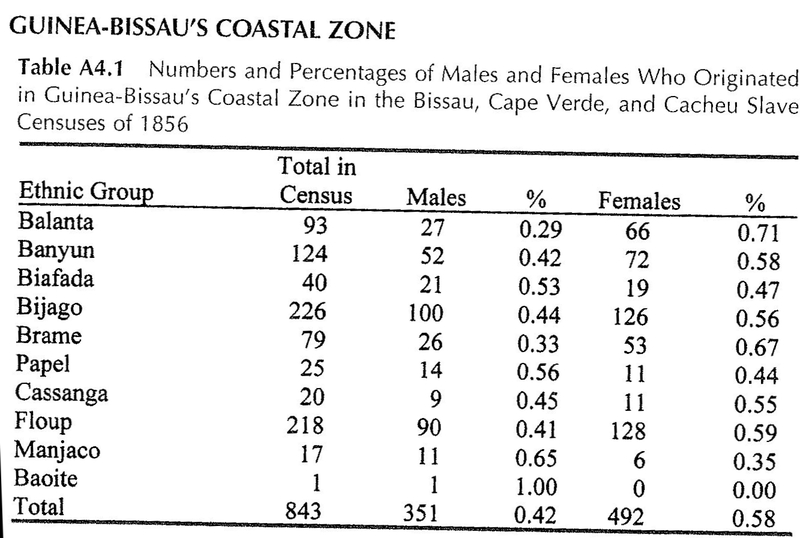 We can see this clearly reflected in the three charts i posted above, which show the combined data from the Bissau, Cape Verde, and Cacheu Slave Censuses of 1856. Indeed most people with specified ethnicity were hailing from within Guiné Bissau and Casamance (Floup=Diola/Jola, Banyun, Cassanga and Baoite) with a total number of 843. Even so this means only over a half (52%) of all ethnically specified captives had coastal Guinean Bissau/Casamance origins. An almost equally large number of 670 slaves was hailing instead from a more interior location, across Upper Guinea. Some of them, the Mandinga and Fula, actually also partially living within Guiné Bissau’s borders but not exclusively so as they are widespread throughout the region. 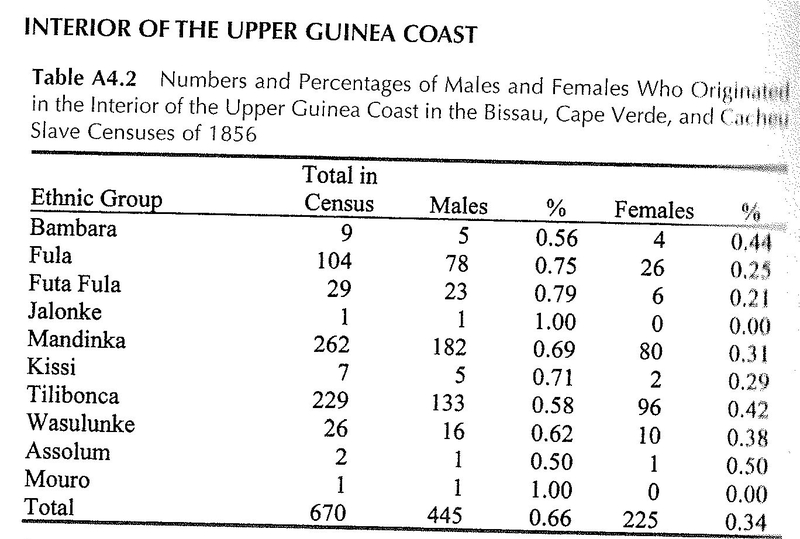 (see this page for detailed ethnolinguistic maps of Upper Guinea). While a remaining 102 people came from either Senegal, Guinea Conakry or Sierra Leone. 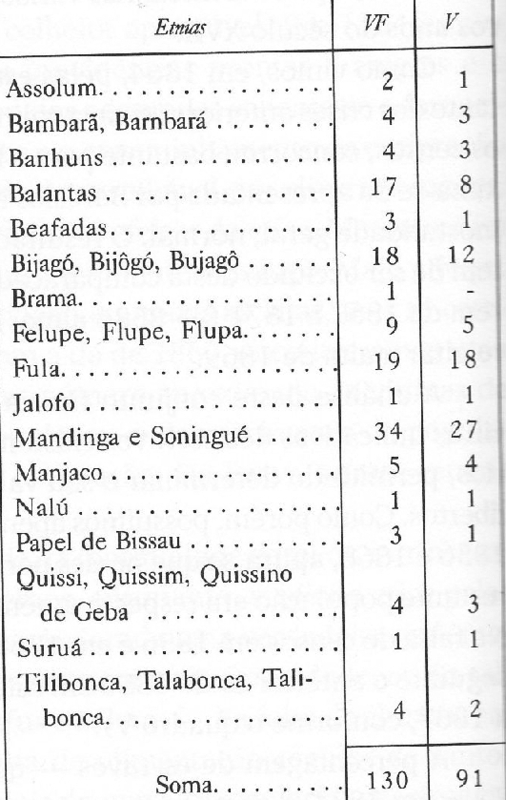 Now of course this slave census can only represent the situation circa 1856 but judging from the Maranhão data and other indications things would still be pretty much the same also throughout the previous century (1750-1850). Actually Cape Verde’s ethnic origins across Upper Guinea would be even more proportionally balanced during earlier timeperiods. For a quick overview see this page. As mentioned already in the first part of this blogpost given the minimal enslavement degree of Cape Verde’s population at this time (less than 6%) it’s actually the earlier timeperiods which would have provided most of Cape Verde’s mainland African ancestry. Especially the connections with (northern) Senegambia and Sierra Leone used to be much more significant until the coming of the English and the French. It is often assumed by historians that possibly already by the late 1500’s all trade between Cape Verde and Senegal was seized permanently. But when carefully reviewing historical evidence this is clearly not true. Eventhough in most cases the trading connections were being maintained through third parties (either Luso-African communities in Senegambia having contacts with Cacheu/Bissau or English/French contraband traders). 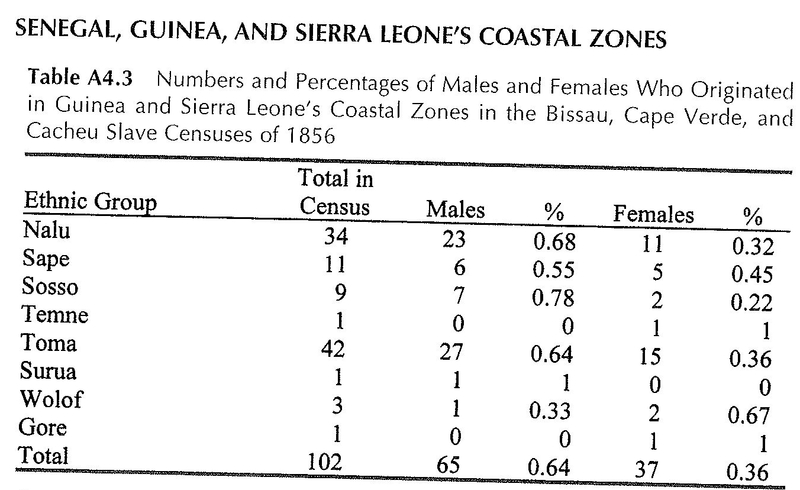 It is therefore quite remarkable that even when limited in number these 1856 censuses are corroborating that Cape Verde received captives from Senegal (‘Wolof’, ‘Gore’ (Gorée)) and Sierra Leone (‘Sape’, ‘Temne’) throughout its entire slave trade history. Right from the start in the late 1400’s up till the mid 1800’s! Assolum/Wasulunké from the Wassoulou region in Guinea Conakry/Mali. Mandé speakers but they are said to be partially Fula in ancestry as well. Bambara, historically referring to captives from the east of Senegambia proper into western Mali, sometimes also more specifically non-muslim ones. Nowadays the main ethnic group of Mali goes by the same name, they are Mande speakers. Futa Fula, likely referring to Fula people from Futa Jallon inside of Guinea Conakry to be distinguished probably from the Fulakunda or Fula Preto from Guiné Bissau, who tend to be more mixed with other ethnic groups and also being more farmers than herders. Kissi/Quissi, are an ethnic group from Guinea Conakry and Sierra Leone, speaking a language closely related to Temne, which also influenced the Cape Verdean Creole language. The Kissi are located in more interior parts than the Temne. there’s even one ‘Mouro’ being mentioned, literally a Moor and probably a Berberspeaking captive from Mauritania. In Maranhão (Brazil) they are also mentioned a couple of times and also in slave registers from Louisiana and Trinidad, always in very few numbers though. Tilibonca was apparently a generic name given by the Mandinga for people from the most eastern parts of Guiné Bissau, eastern Senegal and northern Guinea Conakry, most likely it’s referring mostly toTenda speakers like the Bassari. It’s very interesting and perhaps telling that a couple of these ethnonyms above seem not have been used in the Americas, especially ‘Wassulunke’ and ‘Tilibonca’, it might be betraying a greater familiarity in Guiné Bissau and Cabo Verde with the various subgroups of Mandé speakers and interior peoples of Upper Guinea which would not be that surprising i suppose given the close cultural connections. 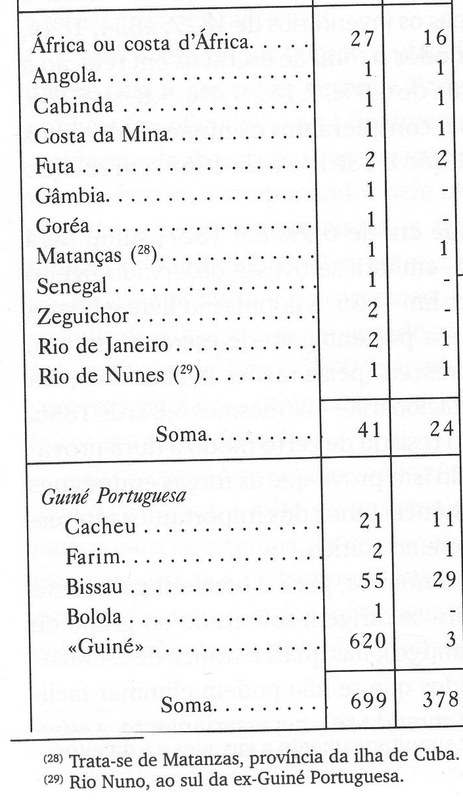 It’s also noteworthy that the socalled Tilibonca were overall the second most frequently mentioned ethnonym in these slave registers for Bissau, Cacheu and Cape Verde combined. Implying their significance in local slave trade and not just being an obscure minority group. But again as far as i am aware this Tilibonca name has never appeared in any slave registers from the Americas. It seems unlikely none of them ever reached the New World among the captives being transported from Upper Guinea. There might have been an early historical mention of them already by the Cape Verdean writer Francisco Lemos in 1684 (see also this link). Possibly instead they were just lumped together with the ubiquitous ‘Mandingo’, although as already mentioned these socalled Tilibonca were most likely distinct from Mandé speakers being most likely Tenda speakers instead. Still even if not native speakers, due to culturalization many would have been able to speak a Mandé language though. As highlighted in the two quotations above the presence of these interior Upper Guineans can be explained because of the fluctuating routes taken by slave caravans from deep inland to the coastal slaveports of Upper Guinea. Usually because of greater demand and higher prices being paid by the English and French most interior captives would have been shipped from nearby the rivers Senegal and the Gambia or also nearby the rivers Nunez/Pongo in Guinea Conakry and the Bunce island in the river Sierre Leone. However due to “market disturbances” like prolonged warfare between either the main European powers or any of the interior Upper Guinean states, the slave caravans were flexible enough to take different routes in order to find other buyers. As mentioned in the French quote these reroutings at times “benefited” the main slaveports of Guiné Bissau already during the 1700’s. However it was the abolition of slave trade, initiated and enforced by the English since 1807, which really gave a new boost to slave trading activities in Guiné Bissau as well as in Cape Verde it self. More details in the last section of this blogpost. ‘Futa’ is most likely referring to Futa Jallon in Guinea Conakry or otherwise the Futa Tooro area in Senegal. ‘Rio de Nunes‘ is also referring to Guinea Conakry and connected with slave trade from Futa Jallon. ‘Gambia’, ‘Gorea’ (= Gorée) & ‘Senegal’, are again suggesting continued connections with northern Senegambia and Cape Verde, even if only for these 3 individuals. Zeguichor (Ziguinchor) is the main slaveport in Casamance, southern Senegal, but would have been still Portuguese ruled by this time. However most surprisingly and fascinating at the same time are the mentionings of ‘Angola’, ‘Cabinda’ , Cuba (‘Matanzas’) and even “Costa da Mina”, which would be referring to most likely Benin/Togo. They seem to indicate isolated individuals associated with internationally operating Cape Verdean, Portuguese or Brazilian slavetraders. But they still give a good impression of the seemingly arbitrary moving around of slaves in between colonies, across the Atlantic and even back again in case of the Cuban and the Brazilians. For earlier timeperiods there’s also some scattered documented evidence of individual slaves from outside of Upper Guinea residing or being sold in Cape Verde. Given known slave trade patterns and the way Cape Verde was set up historically as a collecting point for specifically Upper Guinean captives, their presence is somewhat unexpected. It’s perhaps too early to speculate on their possible ancestral contributions for Cape Verdeans. In this slave census of 1856 they merely represented 6 individuals out of a total of 5182 persons, a miniscule 0,1%. Even so, more details to follow in an upcoming blogpost! 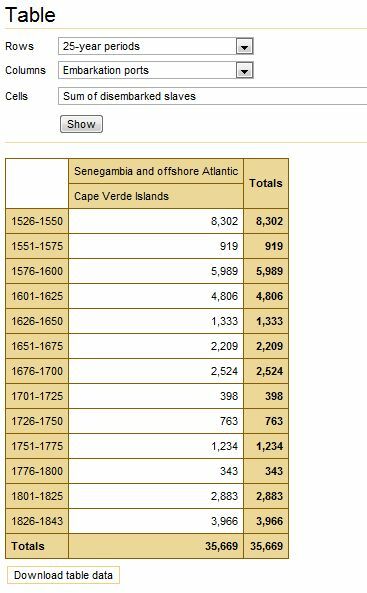 To close off this blogpost it’s sad to observe how after a steep decline of slave trading activities in the 1600’s/1700’s Cape Verde was dragged back into the “odious commerce” again in the early 1800’s. Having been the first main Trans Atlantic slaving entrepot in the 1500’s (see “Shared Upper Guinean roots between Cape Verdeans and Latin Americans“), once more Cape Verde, and more specifically Santiago and Boavista islands were assigned a distributionary and facilitating function by contraband slavers. This took place after 1807 when Trans Atlantic Slave Trade was officially outlawed by the European powers incl. eventually Spain & Portugal (because of continued British pressure). A highly ironical twist to this history is however provided by the newly developing harbour of Mindelo (on the island of São Vicente) and the way it is said to have contributed to the eventual downfall of clandestine slave trading within the Upper Guinean region (see quotations above). The declining and then rising trend of slave exports via and through Cape Verde can clearly be seen in the two charts drawn from the Slavevoyages Database, even when actually its coverage of early documented slave trade (1500’s/1600’s) is likely to be very much incomplete! Given the destruction of relevant archives in Cape Verde and Portugal plus the great extent of slavevoyages not being recorded because of tax-evasion reasons. Therefore it seems safe to assume that Cape Verde’s part in the illegal slave trade of the early 1800’s was less significant relatively speaking than its early pinnacle role in supplying Upper Guinean slave labour to the Hispanic Americas during the 1500’s and 1600’s. Also it should be kept in mind that most illegal slaves who entered Cape Verde in the 1800’s would not remain within Cape Verde but were rather on their way through to other destinations, mostly Cuba, Puerto Rico and Brazil. It was a constellation of factors and circumstances which made Cape Verde attractive again to slave traders in the early 1800’s to serve in a hub like function (see Brooks (2010) and Williams (2014) for more details). However the local demand for slave labour within Cape Verde itself was still very much structurally stagnant. And in fact in the most dynamic part of Cape Verde’s economy starting from the mid 1850’s, the newly developing harbour of Mindelo, slavery was being abolished in 1857 twenty years in advance to the rest of Cape Verde (1878) (Williams, 2014). – Brooks, G. (2010). 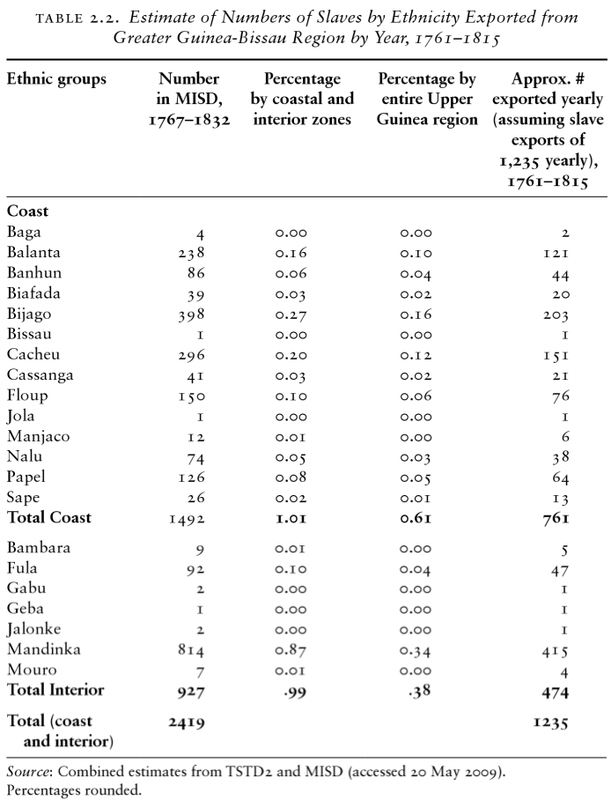 Western Africa and Cabo Verde, 1790s-1830s: Symbiosis of Slave and Legitimate Trades. – Carreira, A. (1972). Cabo Verde: formação e extinção de uma sociedade escravocrata (1460-1878). – Carreira, A. (1988). A Companhia Geral do Grão-Pará e Maranhão. – Hawthorne, W. (2010). From Africa to Brazil Culture, Identity, and an Atlantic Slave Trade, 1600–1830. – Mettas, J. (1975). La Traite Portugaise en Haute Guinée, 1758-1797. The Journal of African History, 16, (3), 343-363. – Williams, D. (2015). Cape Verde at the End of Atlantic Slavery. Slavery & Abolition, 36, (1), 160-179. This entry was posted in Cape Verde, Upper Guinea and tagged CVRAIZ.com, Slave Register. Bookmark the permalink.